Attracting butterflies to your yard or garden is easy and will allow you to view nature up close. The best way to attract butterflies is to plant colorful and fragrant flowers. Butterflies and flowers have a symbiotic relationship - butterflies eat the nectar of flowers and butterflies benefit the flowers by helping to pollinate them. One of the best flowers for attracting butterflies to your yard is the butterfly bush (Buddleia davidii). Butterflies seem to flock to these flowers. 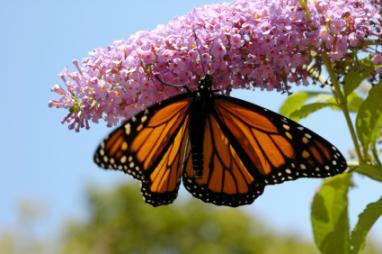 The monarch butterfly in the photo on this page is sitting on a butterfly bush flower. You can see that the flower is elongated and comprised of many tiny flowers. These bloom all summer long, so if you plant one of these you'll attract butterflies to your yard the entire summer. Butterfly bush flowers come in a variety of colors, but the dark purple flowers attract the most butterflies. 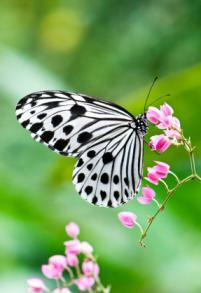 Any colorful flower will attract butterflies to your yard, but the flowers on the list above are butterfly favorites. In addition to flower nectar, butterflies enjoy drinking the nectar from fruit. Because butterflies must drink their food in liquid form, overripe fruit is best. You can plant fruit trees in your yard or you can just sit some overripe fruit out for the butterflies. 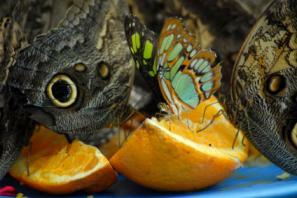 Fruits that butterflies enjoy include oranges, nectarines, bananas, watermelon, cantaloupe, grapes, pears, and apples. Butterflies don't satisfy all of their water needs by drinking nectar - they also need water. Their water must be very shallow because their wings can be damaged if they get wet. You can also attract butterflies to your yard by wetting down a patio or providing some other very shallow water for the butterflies in your yard.